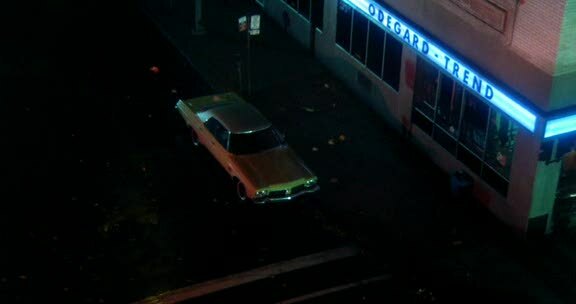 IMCDb.org: 1973 Oldsmobile Delta 88 Holiday Sedan in "Crimewave, 1985"
This is a Sam Raimi film. This is his 1973 Oldsmobile Delta 88 Holiday Sedan that appears in every movie he makes. Oui, CougarTim a dit que c'est la voiture de Sam Raimi. I read that there were doubles for the car in Spider-Man but that was a big-budget blockbuster. In Raimi's earlier films it probably is always his own car. I'm currently reading Bruce Campbell's autobiography, and he claims that Sam Raimi has about seven or eight of these things at any given moment, but always uses his original as a "picture car." This film was the first one in which he ever used stand-in cars for the stuntwork, although his original "classic" was also damaged a bit making this one, and they had to spend about $2,000 to get it running again to make his next film, "Evil Dead 2." 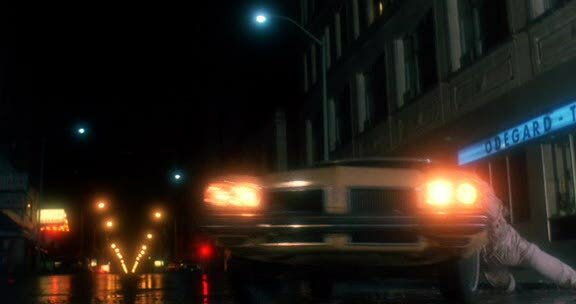 By Sam Raimi's own admission, only about 20% of his Oldsmobile is still original, due to the amount of damage it has sustained in various films.